All hands on deck. In celebration of their fiftieth anniversary, this definitive 5 CD/3 DVD, and budget price 2 CD, collection supplies the true fan of this illustrious British band with pivotal career moments and definitive extras. And if that wasn't enough to tantalise the ears, there is never seen before footage from a German TV studio concert from 1971 and 1973 for the eyes to feast on, too. 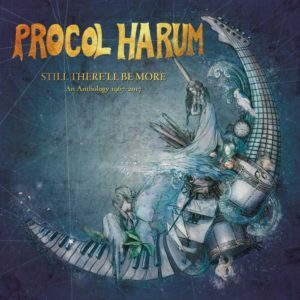 This carefully curated box set charts the arc of Harum's career as they skipped the light fandango with perennial hit Whiter Shade of Pale to their most recent studio opus Novum. A revealing in depth insight with superlative performances from all players. The strong, soulful voice and keyboard playing of Gary Brooker being the constant throughout. These salty dogs are still having their day as this box set masterfully captures them in aspic and also with the wind still in their proud sails.